Flannel Friday - Ahhh Chooo! This is my first week participating in Flannel Friday. I've only been flanneling (is that a word?) or sharing flannel board stories/activities during story time for a few months. The flannel sets have been well received so far and I'm hoping to continue sharing at least one during each story time. The flannel board set I'm sharing today came to being because I was looking for something silly for next week's story times. It is the last week before Summer Reading starts for us and I wanted something low key and fun. I spotted 5 Pretty Flowers in Finger Tales by Joan Hilyer Phelps and thought it was a perfect fit. "I bet they smell pretty too!" But they tickled my nose! I'm hoping the children think this is as fun as I do! I'm also planning on bringing a box of tissues, just in case our pretend sneezing turns into the real thing! Finger Tales also includes a pattern for a sneezing elephant that I might include the next time I share 5 Pretty Flowers. It is awfully cute, but I ran out of gray felt. 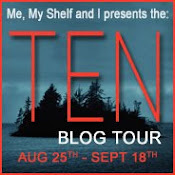 This week's Flannel Friday Roundup is being hosted by Sarah at Read It Again! 6. Cross Country—coast to coast. I never quite did this trip, but I did once travel from Boston, MA to Juarez, Mexico with four of my girlfriends while shooting a movie along the way. 7. The Scottish countryside. 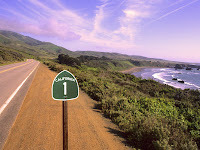 My husband and I spent many days of our honeymoon rambling through the rolling hills on tiny, one-lane roads. 8. 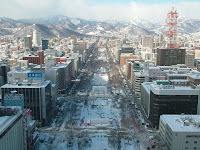 Sapporo, Japan. Japan’s more of a train-taking culture, and though I’ve been there twice, I’ve never been to the island of Sapporo and really want to go. 9. Australia – anywhere. 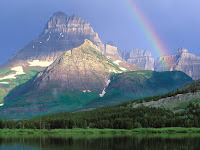 I’d love to rent an RV & just send two months exploring. 10. Hawaii – a friend who lives in Maui just started a company where you can rent fully-tricked out, wifi-enabled vintage VW vans (just like the Pea-Pod in REUNITED!) and tool around the island. I’ve never been to Hawaii and I totally want to go do this. 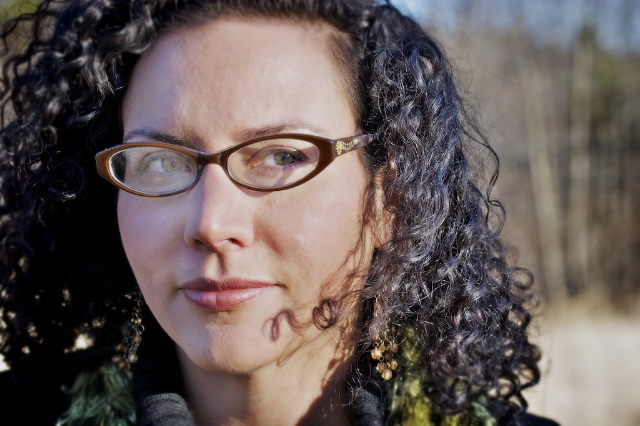 Hilary Weisman Graham is an award-winning filmmaker, screenwriter, and novelist. She lives in rural New Hampshire with her husband and son, roughly thirty minutes away from the nearest grocery store. 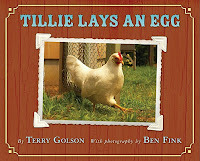 Incubating eggs has become an annual spring tradition at our library. Two years ago, a local preschool class raised money, after incubating eggs themselves and having fun with the project, so that other children could incubate eggs as well. We were the lucky recipients of their generosity and thus our springtime ritual began. This year we incubated 10 eggs and 9 of them hatched! Five of them hatched overnight and were waiting in the incubator all fluffy and adorable when we came in. The other four hatched throughout the day and we even got to witness most of the hatchings. We were quite surprised with the 90% success rate, but happy that we had so many chicks for our patrons to visit. The chicks lived in the children’s reference office for a week after they hatched, by the end they were getting too big for the small space and were brought to a local farm to live an organic, free range life. It was a great experience all around, even if days 20 and 21 of incubation were nerve wracking with too high humidity and even higher temperatures. And, I have to admit that we did spoil our chicks, all named after book characters, by hand feeding them, letting them run around the office, and having them hang out at the reference desk. 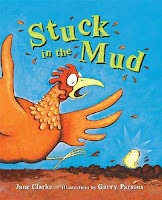 The focus of last week was our chick themed storytimes. We held three of them; two for the toddler and preschool set and one for all ages (which ended up being our smallest session of the week). If you’re a chicken and you know it... (Just like, "If you're happy and you know It!" As well as favorites like, Old MacDonald, Wheels on the Bus, and Zoom Zoom Zoom. I also brought out the flannel board, I’ve just recently gotten into flannel boarding and I try to do at least one flannel story or poem during my storytime sessions. 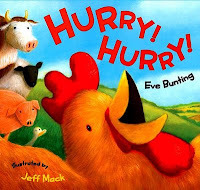 Staying with the bird theme, we sang Five Little Ducks Went Out to Play using flannel pieces and then "Ten Fluffy Chickens," which I found on Mel’s Desk in one of her Flannel Friday posts, where she had a link to Storytime Katie’s felt version. Too adorable! And relatively easy to make, once I figured out how to make the baby chicks. To be honest the kids were more excited for the chicks, which were brought out after the "Good Morning Song," than for the songs or the books. The songs were more successful than the books by far and the highlight was getting to pet one of the chicks. Looking back, I can see a few things that could have been changed. But, since this was a “special” storytime, we had a lot of first timers and also a lot of teeny tinies (the under 12 months set). Not everyone was familiar with our storytime expectations and we in turn had to be flexible. It didn’t help that we had scheduled Kindergarten visits for the same day. We didn’t have the eggs yet when the dates were picked for the visits, so we couldn’t anticipate which day the eggs would hatch or when we would be having chick storytimes. But, it was a bit overwhelming. The day ended up going fine, but I will strive to be more careful next year when scheduling class visits. It seemed like everyone had fun and that was really the most important part. On Wednesday afternoon we had our smallest turnout with only 2 kids and 2 parents. This was the all ages storytime and we really thought more people would come. It was also the session when the reporter for the local Patch news site decided to visit. And while we were happy that the chicks were newsworthy, we wished he stopped by the morning session when there were 20 excited storytimers with their parents/caregivers. 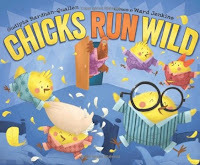 And we added Chicks Run Wild by Sudipta Bardhan-Quallen, which has a great rhyme and was perfect for a tandem reading; the other children's librarian is so much better at voices than I am, so it was fun to have her read the mama chicken's lines. 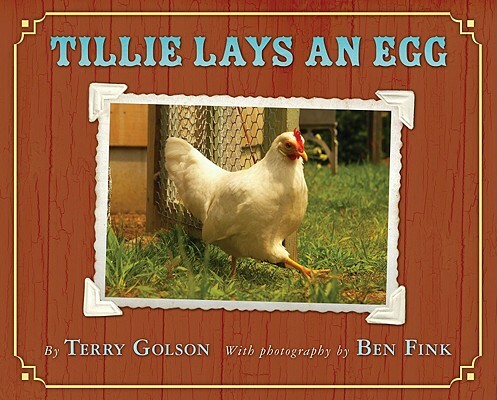 We also put up a display of other chick/chicken related books for patrons to check out. This was the craziest of all the storytimes! We had some very enthusiastic children who wanted to dance and sing (which is normally awesome, but not when there are four little chicks running around!). The chicks were also at their most intrepid. We had outlined a small square using colored tape, which was supposed to be the chicks’ space. During the first two storytimes the chicks sort of huddled together and cheeped, walked around a little, but mostly stayed in the square. On Thursday, they started walking all around the program space! It became more a matter of chick control than actual storytime. There were a couple of close calls – the chicks almost being stepped on and one of the chicks attempting to run behind one of the benches. 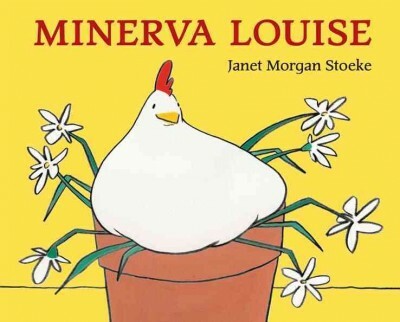 We ended up reading only A Friend for Minerva Louise and Chicks Run Wild, and sang some of the chicken related songs. 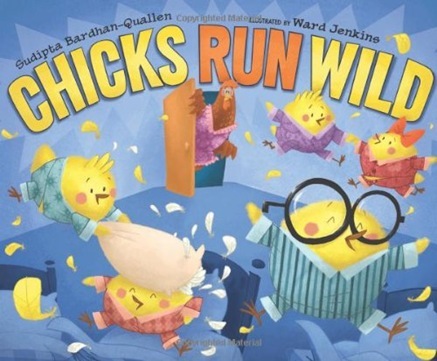 We walked around with the chicks and then ended storytime. The chicks went to the farm on Thursday afternoon and while the children's room is much quieter without them, they are very missed. This is the craziness that was Library Chick Storytime! 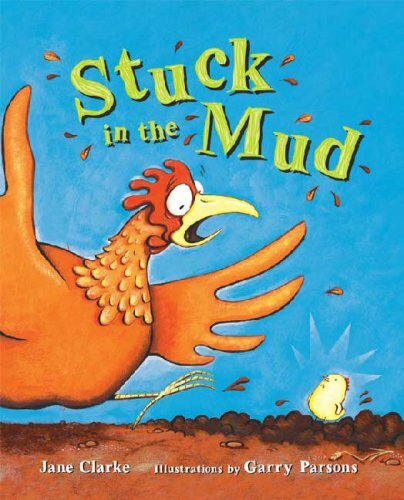 Does anyone have any storytime tips they would like to share or a chick/chicken related picture book they think would make a good addition to a storytime? I would love to read them!